With two weeks of fairy tale play this February, Knicks basketball player Jeremy Lin went from unknown NBA draft reject to the underdog sports hero who sparked “Linsanity.” Along the way, media outlets and fans have commented about his academic prowess (a Harvard degree!) and unfurled a barrage of Lin puns (“Linning!” and “Lincredible!”). Perhaps all too predictably, Lin’s rise has come with observations about his race – sparking pride among Asian Americans, but also debate about racism in sports and America. While some critics have called for media outlets and fans to stop referencing Lin’s ethnic background, the lesson of “Linsanity” is not that we should silent speaking about race. To stop racial insanity in our country, we need to encourage constructive talk about race. For Asian Americans, Jeremy Lin’s success is a beacon of hope. Historically, there have been few Asian American sports stars – especially in the marquee U.S. team sports of football, baseball and basketball. Although the NBA had Chinese star Yao Ming, Lin is the league’s first American player to be of Chinese or Taiwanese descent. Looking beyond the sports world, prominent Asian Americans remain hard to find in U.S. media and entertainment. For these reasons, it’s not surprising that press stories commented about Lin’s race. Whenever a person is the first (or among the first) of a particular ethnicity to succeed in a particular field, that accomplishment is worthy of media comment. Equally worthy of mention is the fact that Lin’s parents are immigrants from Taiwan. While discussing immigration history can bring up racial overtones, it is also a compelling part of a life story which should not be forgotten. Perhaps more significantly, Lin’s early basketball days are laced with stories about how he was discouraged from playing basketball, incorrectly assumed to be a volleyball player, or the subject of racial slurs during games. Those formative experiences are an undeniable component of what now makes his journey remarkable. One day, I hope this need to mention identify someone by race evaporates. I want to live in an America where journalists describe Lin as merely “basketball player” rather “Asian American basketball player.” I want a person’s racial background to become irrelevant to the story of their success. But America is not yet there, and we should acknowledge that truth. Meanwhile, the problem with “Linsanity” is not that Lin’s Taiwanese heritage is part of the conversation. It’s the manner in which his race is discussed that rightfully raises eyebrows. First, there were observations about Lin’s smarts as a Harvard graduate. Although a professional athlete’s academic success can indeed be notable, some comments carried with it a hint of stereotyping about Asian intelligence. In the continuum of racial categorizations, that’s not so bad. Then, there are the constant Lin puns. They range from humorous to mundane, but at least can be chalked up to being part of sports culture. We can live with the cute turn of phrases as long as they don’t tread into racial offensiveness. However, you have to wonder whether the puns would be so numerous if Lin was from a different racial background. But then the racial sensitivities start escalating. Lin’s teammates started bowing to him during games; was that acceptable? And a fan appeared at a game with his face painted as a fortune cookie; was that in bad taste? Things really took a turn for the worse with a comment about Asian male “sexual” size. During Lin’s big winning game against the Lakers on February 10, Fox Sports columnist Jason Whitlock sent this tweet: “Some lucky lady in NYC is gonna feel a couple inches of pain tonight.” Seriously? The Asian American Journalists Association swiftly demanded an apology. But can we finally move past attitudes that perennially asexualize Asian American men? Then, came some racial envy. In a Twitter post of his own, boxer Floyd Mayweather, Jr. wrote: “Jeremy Lin is a good player but all the hype is because he’s Asian. Black players do what he does every night and don’t get the same praise.” Rather than just praising remarkable play by a new star, Mayweather had to turn the situation around as if media coverage for an Asian American player is an affront to African American athletes. To Mr. Mayweather, I say: the rise of an Asian American star need not threaten players of other races. There is plenty of media thunder to go around for everyone who deserves it. This past weekend, the racism discourse reached fever pitch when ESPN’s mobile web site used the headline “Chink in the Armor.” The story reported on the Knicks’ first loss with Lin as starting point guard (to the Hornets on February 17). This racial slur quickly ignited plenty of “WTF” fury on social media posts. ESPN removed the headline a mere 35 minutes after it was posted, fired the writer, and issued a public apology. But that was only part of the story. The day before that mobile web site story, ESPNEWS broadcaster Max Bretos also used the phrase “chink in the armor phrase” on air. ESPN suspended him for 30 days. Yet a third incident happened on ESPN Radio New York, though the racial slur was evidently not uttered by an ESPN employee. But perhaps it’s time to take a collective deep breath. We should rightfully be offended when racial stereotypes and slurs are hurled at anyone. But the answer is not to neuter our public discourse so that it’s unacceptable to even utter “Asian American” in the same breath as “Jeremy Lin.” His Asian lineage is a distinctive part of him, of what makes him unique in the NBA, and of what makes his groundbreaking journey so riveting. Yes, it would be nice if pro basketball were so full of Asian Americans that Lin’s ethnic heritage is irrelevant. One day, that may be true. But for now, he’s a story – in part because of his Cinderella rise to stardom, but also in part for his uniqueness as an Asian American in one of America’s premiere professional sports leagues. Let’s not run away from that. At a much bigger level, it’s also critical that we become a country that can speak about race issues. We just have to make such discussions constructive, not destructive. Particularly in the media, reports should limit talk about racial factors to when they actually bear relevance, rather than automatically defining someone by their ethnic background when it is irrelevant to the story. 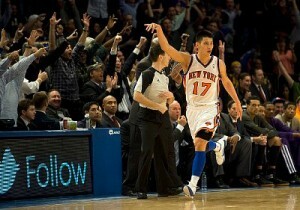 For his part, Lin seems to be taking all the racial “Linsanity” in stride. He proudly considers himself a basketball player who happens to be Asian American. But he doesn’t run away from the elephant in the room. Acknowledging the dearth of Asian Americans in the NBA, he has observed that “Maybe I can help break the stereotype. I feel like Asians in general don’t get the respect that we may deserve whether it comes to sports, basketball, or whatever it might be.” From a young man still finding his way, these observations are an example of where his and future generations need to evolve when it comes to racial discourse. We can’t run away from race, but we should not let it singularly overpower who we – or everyone around us – are as human beings. For future generations, I hope for a post-racial America. I hope for a country where the next Jeremy Lin’s of any color can succeed in any sport and any professional field they choose. When they do, I hope their race is just a part of their personal backstory, rather than the headline.